The Pinwheel Galaxy (also known as Messier 101 or NGC 5457) is estimated to contain at least one trillion stars—about 100 billion of them could be similar to our sun. 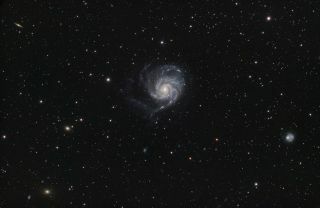 Equipped with an arsenal of telescopes and cameras, a French skywatching enthusiast had to venture beyond his suburban home in the so-called City of Lights to capture a brilliant deep night sky image of the Pinwheel Galaxy. "I live in the suburbs of Paris, in a site that is very polluted by city lights," amateur astronomer Thierry Legault wrote on his website. "From my backyard, I can take images of the sun, the moon, planets and nebulas with narrow band filters. For night sky imaging (galaxies, comets, nebulas...), I am obliged to go in the land, after loading my van." The talented astrophotographer, who has become known for his eye-catching images, works as an engineer by day. The Pinwheel Galaxy, which is also known as Messier 101 or NGC 5457, is a spiral galaxy 21 million light-years away in the constellation Ursa Major. The galaxy was first discovered by Pierre Méchain on March 27, 1781. Charles Messier confirmed its position and it was included in the astronomer's famous Messier Catalogue as one of the final entries. A light-year is the distance light travels in one year, which is roughly equivalent to 6 trillion miles (10 trillion kilometers). Multiple exposures are made to collect enough light for an image that would otherwise not be evident to the eye. One remarkable property of this galaxy is its huge and extremely bright regions where star formation recently took place. The galaxy shines because about 3,000 of these regions can be seen in photographs. These areas contain hydrogen in its ionized form and exist most commonly in the disk of a spiral galaxy. For such a region to exist, there must be a source to provide the ionizing heat, so they are commonly located near very hot stars.